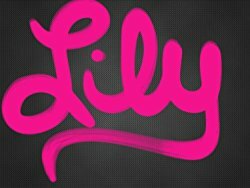 Today I’m conducting a session with…Lily Vega! *Leave a comment for Lily and share this post to be eligible to win a paperback containing the first three stories of the Devil May Care series. Lily: Watching a beloved family member battle Alzheimer’s disease was a lesson in courage and gratitude. It was a sobering reminder of the many tangible and intangible things that can easily be taken for granted. Hospice caregivers are truly earthbound angels. Me: I couldn’t agree more about hospice caregivers. It takes a truly special person to be able to do the job they do with grace and love. Lily: Per the Meyer’s Briggs Personality Inventory, I am a feeler, which enables me to connect deeply with my characters. Sometimes being a feeler can seem like a negative thing, especially when writing sad scenes. Me: I’m a feeler too! Lily: Introversion is a big one. The whole marketing and promotion part of being an author can be extremely uncomfortable for an introvert. At events, making an effort to mingle and meet new people, while always rewarding, puts me out of my comfort zone. Me: So many of us authors are introverts! You’re not alone! What was your high point as a writer? Lily: My husband and I were having breakfast at a res taurant and I decided to check my email while we waited for the check. The day before I had submitted a novella, Devil Inside, to Changeling Press after receiving a request at a Savvy Authors pitch event. My inbox contained an email from the publisher, Margaret Riley, expressing interest in publishing Devil Inside and the other stories in the planned trilogy. I burst into happy tears, terrifying our server. My husband graciously read the email on my phone and confirmed that I hadn’t misread the message. Changeling has been incredibly supportive of my writing career. The Devil May Care trilogy turned into five stories. The final tale, Impishly Yours, was released last year. I am currently working on my tenth story with Changeling, Emotional Rescue, which is part of their Set In Stone multi-author series. Me: The first time a publisher wants your books is always special. It’s a validation of everything you’ve worked for! And Wow–I didn’t realize you had so many books out! What was your low point as a writer—a time when you questioned your path? Lily: I entered the opening pages of Devil Inside into a contest and while I received a score in the mid-eighties, another judge gave my entry a twenty out of a hundred possible points, the lowest possible score. The written feedback that accompanied the low score was equally harsh. While devastated, I forced myself to keep submitting. I have come to realize that our reactions to fictional works is subjective. Just like I don’t love every book I read, my writing style doesn’t resonate with everyone and that is okay. Submitting writing to a critique partner, to a contest, or to an agent, or to an editor is an act of courage. The only way we can become better writers is send our stories out into the world. Me: Amen Sista! It certainly does take courage! I too have had a similar experience with a contest judge. And I’ve always wondered if judges like that know how devastating their comments are? I can forgive ignorance, but I can’t forgive maliciousness. What causes stress in your writing life? Why? Lily: My internal editor (i.e. my self-doubt) constantly causes me stress. Many days getting words on the page is a struggle. Sometimes I find myself poking at words I have written instead of writing new ones. I continue to explore ways to suppress my desire to edit as I write. The best thing about writing for me is discovering the story and learning about the characters. Me: I share your struggle. I edit as I go too. I’ve tried to just keep writing, to just get a draft down, but I can’t. I’ll stall out and stare and stare at a blank page, but be unable to write a word. Unfortunately, editing as I go is the only way I can keep forward momentum… Which sounds weird, but is true. 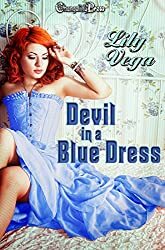 Lily: Stepping into the shoes of Xanthe, from Devil in a Blue Dress, would be a wild ride. Being a lust demon, she has two love interests, True, a loving beta hero, and Ray, a bad boy alpha. Xanthe operates solely on the pleasure principle. Being Xanthe for a day would definitely be a unique experience. Me: If you could have dinner with any famous author who would it be? Why? Lily: Stephen King is a personal hero of mine. I have loved his writing since discovering him in high school. His storytelling always blows me away. His writing craft book/memoir On Writing candidly disclosed his struggles with addiction. The hard part would be to actually eat dinner and not fangirl too much. If you haven’t read King in a while, check out his Bill Hodges trilogy. The final book, End of Watch, was recently released. All three books in the trilogy stand alone, but tie together perfectly. Me: Uhm… Can I come too? 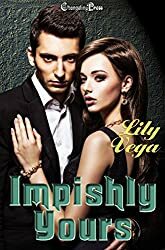 Tell me about your spicy paranormal romance, Impishly Yours (Devil May Care #5). Me: Share with us a favorite paragraph or two from your newest release, Impishly Yours. Killian cringed at the besotted expression on the face of the drop-dead delectable Elf. The gorgeous female would be an unwelcome distraction without Eros’s twisted magic. But one locked and loaded with fiery love was nothing short of apocalyptic. “Good to see you, old friend.” Eros wiped the crimson smudge on the tip of his golden arrow with the black fabric swatch he had removed from the prisoner’s eyes. “If you were my friend you wouldn’t have used your love mojo on me.” Killian forced himself to unclench his fists. Certain Eros had engineered events to make him the object of Beryl’s desires, Killian allowed the poison of the accusation to burn on his tongue before swallowing the bitter words. While he wasn’t without his own considerable powers, punching a deity would make matters worse. Even one who’d brought him a beautifully packaged nuclear bomb with the countdown clock ticking. My Christmas Elves stories give me an opportunity to play. I love Killian’s horror at his reaction to the lovestruck Elf. The paragraph is special to me because Killian and Beryl are both vulnerable and the friendship between Killian and Eros is tested. Abbie Roads writes dark emotional novels featuring damaged characters, but always gives her hero and heroine a happy ending… after torturing them for three hundred pages. RACE THE DARKNESS and HUNT THE DAWN are available now! SAVING MERCY Book 1 in the Fatal Truth Series is now available for pre-order. WOW! I am overwhelmed by the fantastic response! I used random name picker to choose THREE WINNERS of the DEVIL MAY CARE TRILOGY in paperback! Congratulations to: Beth Ann Tilley, Esther Gerdzen, and Michelle Willms! I’ll contact you via email for your mailing address and send out your books next week. Thanks again, everyone and belated Happy St. Patrick’s Day! Shared post 🙂 New author to me ! Thank you so much, Esther! I appreciate the share! I think it’s amazing that we’d have dinner with the same author for many of the same reasons. I cannot thank you enough for sharing with us. It’s so refreshing to “meet” an author who’s human and not afraid to admit it (or maybe afraid, but admits it anyway, which is even braver). You are a brave, fantastic author. You are welcome to join us for dinner! Thank you so much for your kind words! I am on deadline for my next story, a gargoyle romance and your encouragement is much appreciated. Sometimes the blank page is darned terrifying. Endings are tough for me, because I want to do right by my characters and give them a great happy ever after. Thank you so much, Desiree! I appreciate the tweet! Thank you so much, Katrina! I appreciate you sharing this! Thank you so much, Angie! I appreciate you sharing this! Just tweeted for my chance to win! I loooove paranormal so I am so excited to read some of your writing! Hoping to begin with a paperback copy! 😉 Thank you for the chance! Thank you so much, Heather! I appreciate the tweet! Paranormal romance is one of my favorite genres. I love giving my characters a happy ever after. Thank you so much, Aureliana! I am so blessed to be on Abbie’s couch. These books sound awesome! I can’t wait to read them. I have never read any books by either you Abbie or Lily Vega but I can’t wait to start reading them. 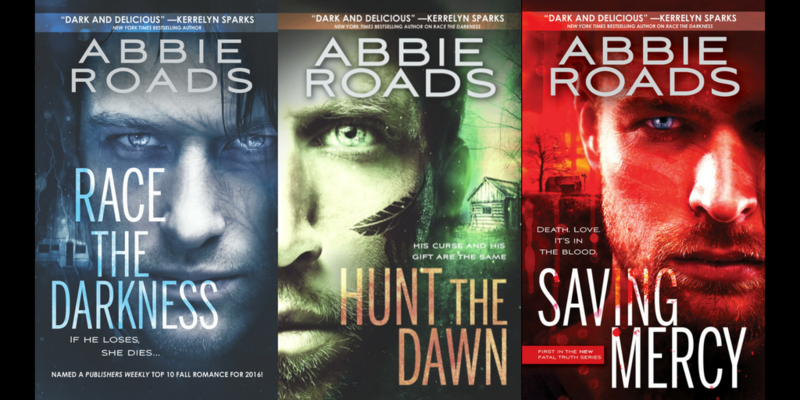 Now’s a great time to pick up Abbie’s books! The Kindle version of Race for the Darkness is under $4 and the sequel, Hunt the Dawn is 99 cents for a limited time. My books have all sorts of fun supernatural creatures from vampires to lust demons to Christmas elves. Thank you so much, Beth! I hope you enjoy them! Thank you so much, Linda! I appreciate the tweet! I love writing the elves! Great interview! “While devastated, I forced myself to keep submitting. I have come to realize that our reactions to fictional works is subjective. Just like I don’t love every book I read, my writing style doesn’t resonate with everyone and that is okay.” really resonated with me today! Another trick that can help is going on Goodreads or Amazon and looking at reviews of some of your favorite books. In many cases, they have one and two star reviews, The negative reviews don’t decrease the value of those books. Don’t let negativity decrease the value you place on your own work. Hugs! That’s a good point, Lily. See how other people reviewed books that you loved. Hey Lily! I’ve also shared receiving the harsh words from a judge. It’s leaves you really bummed and getting back to the keyboard is hard. So glad you kept at it!! I am glad you’re back at the keyboard too! One of the things that helps me deal with negative feedback is to try to dig deeper for constructive criticism. Sometimes the critique so general or mean spirited that spending more time with it only makes me feel worse, but other times nuggets can be pulled out and used to make the story stronger. Rephasing the comments into constructive criticism can really help. Great interview, Lily. I’ve really enjoyed your stories. That contest judge was crazy! I am so glad you are enjoying my stories! Great interview! I’m definitely checking out your books. Have a great St. Patrick’s Day! Happy St. Patrick’s Day, Marcia! I still need to hunt down a Shamrock Shake before its out of season. Thanks Abbie and Lily! Lily … you are a new author to me so it was great to get to know u thru this interview. So many things u touch on connect with me. Your comment about the hospice workers, being an introvert, dinner with Stephen King ( JD Robb would be my choice first, then Stephen King!). I also like to read about what make Writers/authors tick. How you and Abbie edit as you write for example. Thank you both for sharing ! I’d love to see Stephen King and J.D. Robb together. One thing I love about both of them is that there would be zero sugar coating. They tell it like it is. The kindness and compassion of the hospice workers blew me away. Their presence provided a safe zone. We are extremely blessed to have such people in the world. I do edit as I write. While I am trying to break the habit somewhat to increase my productivity, I find that editing the previous day’s work provides a nice grounding in the story world to help get me in the zone to produce new words. It can be really easy to keep revising opening chapters and make incremental progress. I’ve found that its best for me to force myself forward to completion and go back to edit more once the first draft is done. What an interesting interview…none of the trite answers, but then, none of the trite questions 😉 Thanks to both of you! Abbie’s questions were very thought provoking. Always interesting to poke old wounds (e.g. bad contest feedback) and find a little scar tissue but no more pain. Great interview! I will definitely be checking them out. Abbie and Lily, both of you know of my recent loss to Alzheimer’s. A devastating disease. It’s very hard on the family. But, enough about me. Most contests, at least ours, tries to convey helpful critiques without demoralizing the entrant. However, I too have had some bad reviews. One so bad that I totally walked away from my writing. I’ve read a few of Lily’s naughty elves. Sometimes you just need a bit of twisted fun to take you out of your doldrums. I’m so sorry for your loss, Barb. Alzheimer’s is a cruel disease. I am so glad that you came back to writing. With all your finals and contest wins, your books will be on the shelves soon. I can’t wait to read them! I am thrilled that you enjoy my elves. Those stories are so fun to write. Thank you so much, Marin! The naughty elves are so much fun to write! One of my favorite things is brainstorming ideas based on the theme of the year. How can you go wrong with Peppermint Twist, Reindeer Games, and Yule-Tied? I’m looking forward to finding out this year’s theme! Woohoo! I finally got you on my couch! Thanks so much for being here! So happy to be here! Thanks for having me, Abbie!! Great to see the inner workings of the mind of Lily Vega. Love the idea of auctioning off one’s virginity to save her clan from bankruptcy. Great way to spin a trope. I love writing and reading paranormal romance. Wow. Thank you Ms. Abbie and Lily! I’m an introvert as well and I agree​ with you. I haven’t read your books yet. But I will be adding them to my to read list. I love discovering new authors to me. Great to meet a fellow introvert. Finding new authors is one of my favorite things. I hope you enjoy my books. Love this interview. 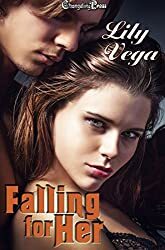 Definitely have to check out Lily Vega’s books! Thank you so much! Abbie asked some tough questions! Sorry to spell your name wrong, Latifa! My kitty cat wanted to say hi to you by jumping on my keyboard when I was typing the reply. She hit the enter key before I was done. I enjoyed reading about you Lily! Your excerpt sounds interesting, and I really love the covers too! Looking forward to seeing your new cover! Congrats, Lily! What a great story about your journey to publication! Thank you so much, Saralee!